Kantapon Metheekul’s creativity extends from advertising to digital art and to fine arts. Kantapon finds inspiration for his hand-drawn illustrations in everyday life, fashion, and people. Suntur graduated from Silpakorn University with a Bachelor of Fine Arts. Before claiming himself as a full-time artist, Suntur worked as a creative in the advertising industry from 2010 to 2015. His practice ranges from illustration for books, magazines, posters, products packaging, installations, clothing and visual art. Is an interactive installation work that will make you question: what is a point? พบกับ Nara Thada ศิลปินและสถาปนิก กับผลงาน . o . ที่ชวนให้คุณได้สัมผัส, มอง, และค้นหาคำตอบว่า "What is a Point." Robert Fan is a visual artist from Taiwan. Fan specializes in experimental films that play with non-linear narratives. Suthidee Piyayothin is currently collaborating with Robert Fan on the project "Readjusted Scenery". Inspired by the Thai-Chinese and Taiwanese backgrounds of Piyayothin and Fan and the scenes of visual culture and contemporary art in those respective countries, the work points to the different circumstances of visual cultural and colonial histories and how these ideas shape the way the artists experience the American cultural landscape. Project 33 is a situationist project that positions the artists to react against the immediate psychological and physical environment. Naturally, the work revolves around the simultaneity of human communication. Ermione is a former exhibition designer who became an illustration artist when she came to New York. She began drawing when she was a child. Back then, strongly inspired by Japanese cartoon, she dreamed of being an artist. She left behind that dream when she was growing up since artist is not a very popular career in Thailand, especially cartoon artist. And then with a great opportunity , she flew to New York city and found that she could successfully be and do anything she wanted if her intention was strong enough. This is the point that changed her life forever. Wattanachote’s work is an installation consisting of crafted paper cut-outs, pinned between the crease of a wall separation. The paper cut-outs bridge the differences between the two surfaces, evoking multiple models of duality. The natural form of paper is pierced through by bronze nails, a manmade materiality, yet the forms' coexistence is dependent on each other. Other instances of duality are that of: the naturalism of the paper cut-outs versus the solidity of the wall surface, the work of art versus the installation site, or that of the speculated artist and the speculative viewer. Nutthawut Siridejchai is a typewriter artist. Working exclusively with the typewriter, Siridejchai explores how constraints can lead to more sophisticated developments of forms and ideas. Meet Nelson Howe and his latest book, "My Adventures in Bangkok." at "What is a Point." New Year is a great time for everyone to set a new start for their many new things in life. Many traditional Thais enjoy going to the temple for new year's merit making with their family and friends that somehow this mass crowd, in the other hands, demolished the calmness and peaceful of the temple which is actually the exact core values of Buddhism temple itself. 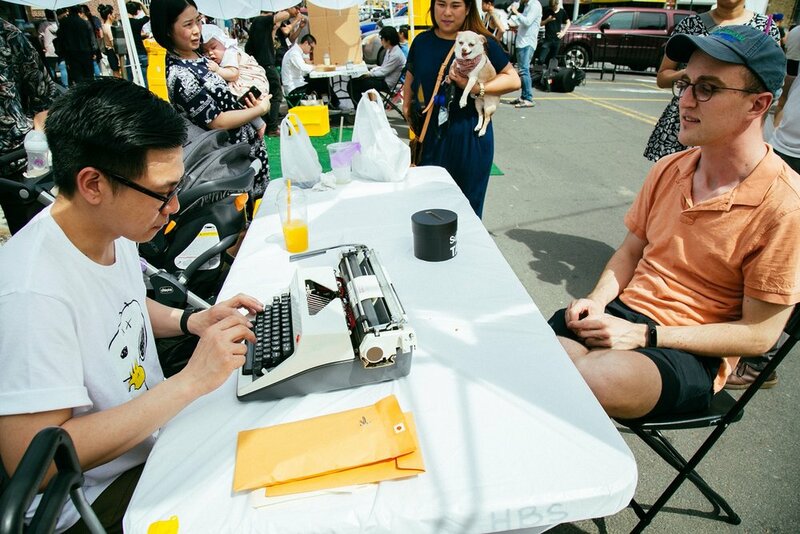 Using fluxus aesthetic with a twist of Buddhist traditional ways of new year's merit making, the artist invites the public to write their own stories in the past that they thought as a bad luck and wanted to let go in the providing space. In this strange facsimile street temple, Jan addressed the problem of finding inner peace in this mad age of technology between the landscape of reality and fiction. 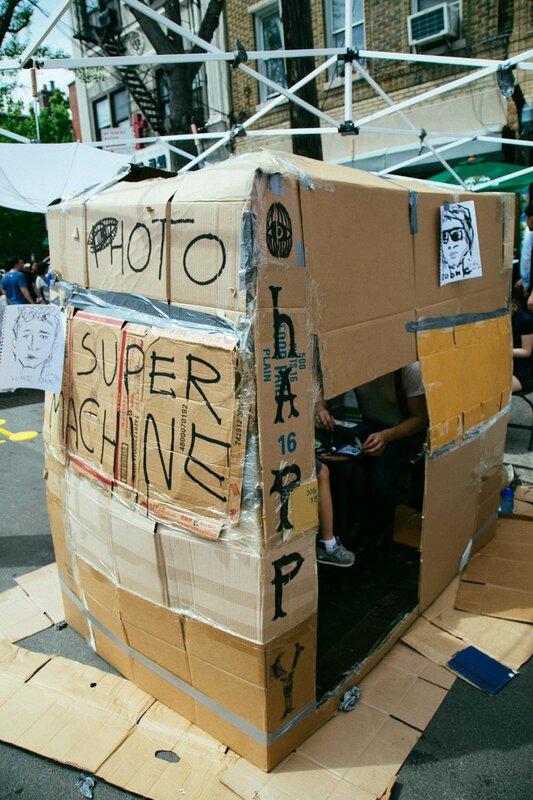 Suphitcha Donsrichan (°1986, Bangkok, Thailand) makes drawing, photo, installation, gif art and mixed media artworks. Her work is built on applying her experiences on everyday objects to devise narratives that link between fiction and reality. By exploring the concept of landscape in a nostalgic way in witch fiction and reality meet, well-known tropes merge and meanings shift with past and present fuse, Suphitcha plays and explores on a fragile link between visible and invisible reality that imagined by its conceiver. Her work employs poetic metaphors that comment on broader social issues and universal human emotions and desires. Suphitcha had her first mini solo exhibition - Unwrapped - at Sugar Club art space in May 2016 and now continue working on her Wordplay project. She currently lives and works in New York. U.S. born, Thailand raised, choreographer, dancer, and actress, Pearrie Hammie (or Skulgan Phiphobmongkol,) has achieved so much comparing to her age. Pearrie started dancing at the age of 3 and she has trained in so many dance styles from hip hop/street jazz, popping, locking to ballet, jazz, contemporary, and ballroom. Moved to New York in 2012, without being signed or having many connections, Pearrie has passed auditions and worked with many industry-level clients such as HBO Latino, Microsoft, Facebook, McDonald’s, BET One Shot, and Good Morning America, as both a dancer and a choreographer. Furthermore, Pearrie has been directing her own New York based dance group, Pearrie Hammie Dance Group, which has been serving clients from small party level to high level companies such as HBO Latino and BET. Besides the industry, Pearrie has been around the dance community as well. After joining a few dance teams, she has been invited to direct Synchronic Dance Team, an NYU based dance team, as a guest artistic director and teach workshops for different dance groups and organizations such as Unique Movement, Synchronic Dance Team, FIT Dance Company, and Good Vibes Entertainment. During her time in Thailand, started at the age of 18, she had worked full-time with the country’s top artists including Bird Thongchai, Christina Aguilar, J-Jetrin, Bie Sukrit, Ice Saranyu, and so on. And she had also starred in Fame The Musical, Prissana The Musical, and Red Roof The Musical produced by 2 of the top musical theatre companies, Dreambox Theatre and Nub1 Neo Film / Click Radio as a supporting role. Pearrie always believes that dance is for everyone and to herself, it is also another way of expressions and sometimes it speaks even louder than words. "8ELVEN" is a jazz/funk/fusion band, performs modern jazz compositions form jazz fusion artists such as Chick Corea, Mike Stern, Joshua Redman, Avichai Cohen and many more. The band consists of 5 fine jazz musicians living in New York City, Julphan Tilapornputt(guitar), Kengchakaj Kengkarnka(keys), Jim Piela(sax), Trevor Brown(bass), and Josh Schusterman(drums). Unlike other jazz band, 8elven focuses on high energy and energetic performance. They improvise and interact in jazz/funk context. 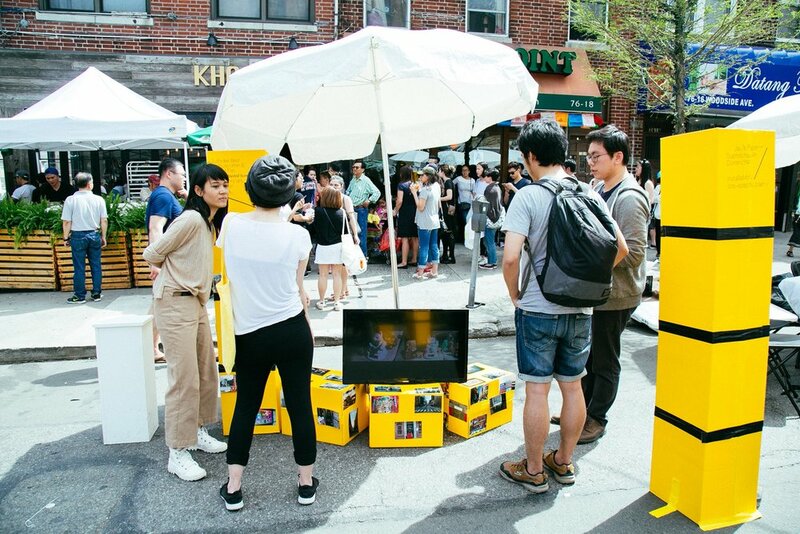 Experience outdoor exhibition from diverse artists. Enjoy the workshops and have fun with various performances. Don’t be so down, not able to join Thai military and serves our country, folks! Buckle up and come to SPRINGBOARD Songkran Art Walk for your dose of fun time! Because we just confirmed our very very special guest, Nelson S. Howe !!!!! Flying back straight from Bangkok for this event. 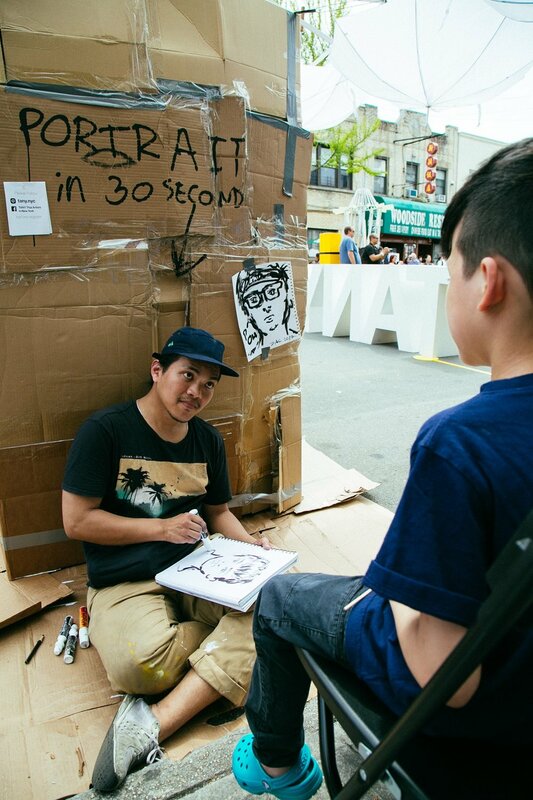 Pairoj Pichetmetakul, street painter who goes round NYC painting homeless to raise awareness for those in need is coming back in town and you’re all invited to join him painting on his mighty scroll! WX is the combined vision of saxophonist Dennis Shafer, electronic musician/guitarist Teerapat Parnmongkol, and drummer Jake Adams. Performances are improvised from beginning to end as the horn brings a lively voicing to effects driven warping chord changes over hypnotic shifting rhythmic patterns. Since childhood, Jay's Paper love in art started with her exposure to manga and anime, which naturally allows her to be passionate in the act of drawing as far as she can remember. With her background as professional architect combined with her various interests in history, society and arts, her work explores relationship between people, things, places, and the society that exists around it. What is it that moves people's heart, how and why. Gongkan Kantapon Metheekul’s creativity extends from advertising to digital art to fine arts. Obsessed with arts, Kantapon finds inspiration in his hand-drawn illustrations in everyday life, fashion, and people. Zac is interested and passionate about art that is hidden inside the Thai folk way of life such as li gae, Thai slapstick, the use of dazzling colors, wordplays and spoonerism. To him, they are the charm of Thai art that he grew up with. He takes these stories into his art-making practice, which often combines different kinds of color, including oil, pencil, and markers. He tells the story and his thoughts via paintings and handwritten texts, communicating what is inside. Besides painting on canvas, He also works with mixed media. Surtur earned a Bachelor of Art Silpakorn University. Before claim himself as a full-time artist, Suntur has creative as another titled for his career in advertising agency from 2010 to 2015.
we had exciting events, loss, and farewell. All of those are in our brain and subconscious mind. When something alike past events stimulates our mind, it will remind us of those past events again. All those stories and atmosphere will pop up in our mind every time we think of them. through times, nothing lasts forever. Many stories happen to teach us to realize that to meet and depart is the way of life. However the stories stored in our brain can be recalled anytime. This is related to the belief of “the mind is more important than the substance and only the mind is the truth.” The knots of ideas are deeply buried in the memory overlaying with long and complicated stories of the things we loved, bound, saw, familiarized, and became the distortion of memory hiding the state of mind which cannot be seen with bare eyes. "I'm interested in natural ecosystems and the cycle of life. The laws of nature and the three characteristics of existence in Dharma of Buddhism (impermanence, incompleteness and non-self) inspire me to tell a story through my art. I prefer to keep such stories discreet within the painting, allowing the viewer of my artwork to either discover it exactly as I had intended, or leaving them to find a story of their own within the brush strokes and layers." "I have a dream of being an artist, but I have never thought I could be an actual artist until now. I love to draw a lot. I have been drawing since I was ten when I started watching Japanese anime and became obsessed about it. Sailormoon, a famous girly anime, made me tried hard to draw cartoony human as accurate as possible. My drawing skill kept improving. When I grow up a bit, I desired to be able to draw realistic human as realise as possible. I drew a lot. I drew on everywhere. My textbook full of human faces. I really enjoyed practicing and my goal achieved. People around me admired my artworks. And then I stopped hand-drawing. I chose to study graphic design in university because the idea of making money, getting a job like normal people do, took over me. Despite the graphic design study, I quietly drew some fan arts from anime I was crazy about, just to please myself. I love to draw fictional character to look realistic. The portrait I draw always focus on the eyes and lips, the most express feature spot on face. Portrait, face, eyes and lips inspire me to create my original artwork. I used to fall in love with drawing with mere pencil. And then I had tried painting on computer as know as CG painting, which I found that it was so fun. Watercolor is a new thing for me. Now I fall in love in it. I won’t stop trying new media and technique because I still have not discovered my very own style that one day will rock the world."